In one of our conversations I asked her about her findings, if any, of good Swedish food in NYC. I do not know enough about Swedish food to be able to judge whether it’s a good representation or not, but I DO know that I like every single Swedish meatball I’ve ever tried. Be it the Lean Cuisine frozen dinner (which I imagine would offend the Swedes), the cafeteria style ones at Ikea, or the various Bar/Bat Mitzvah/Wedding appetizers on toothpicks, they are all pretty tasty as far as I’m concerned. When this student finished up her series of lessons, she surprised me with a generous gift of a credit at the restaurant she had discovered and raved about. 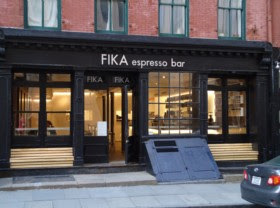 There are a few locations for Fika, and my first attempt was actually to the one in midtown. It was so tiny and crowded, with only a couple of stools and small tables that my friend and I decided to go somewhere else for lunch that day (If you’d like to read about that one, please see http://careysculinaryadventures.blogspot.com/2011/02/todd-englishs-plaza-food-hall-1-w-59th.html) and retry a different Fika location next time. We did a little looking around online and found that the Pearl street location looked much more promising as far as getting a seat and relaxing over lunch. Although their business was steadily hopping, there were plenty of places to sit when we arrived. We ordered our Swedish meatball platters and a salad to share and were told that they’d bring it out to us when it was ready. As we sat down I had a moment to notice my surroundings. It does sort of feel like it was designed at Ikea. 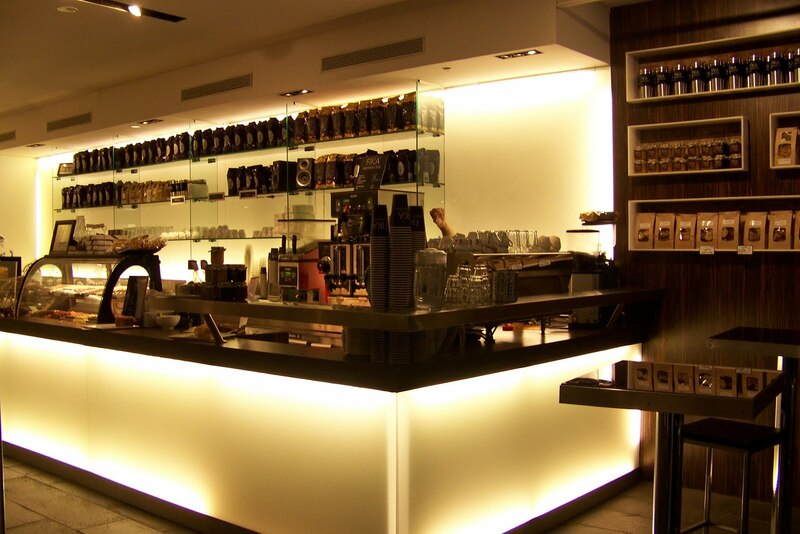 It has a sleek decor, shiny black tables with sharp edges, bright, modern lighting, a view of the chefs making chocolate, plenty of gift items and cases of delicious looking sandwiches and desserts. The crowd was a mix of financial/business types and international tourists. The items they serve seem to all be authentically Swedish- but what an odd mix. It’s essentially an espresso bar that serves fresh chocolates and meatballs among other things. Our salad was lovely and large, more than enough for the 2 of us to share. Fresh ingredients with a great, light balsamic dressing. The peeled orange slices and slivered almonds were a nice touch on the mesclun/radish/tomato salad. The meatball platters arrived and we joked a little about our ‘light’ lunch of meatballs and a mound of mashed potatoes the size of 2 fists. We probably could have shared one order- but they were so tasty that both of us pretty much filled our tummies to the brim. Delicious. So THIS is what ‘real’ Swedish meatballs should taste like. It’s a really interesting flavor, complex and earthy with a pungent, sweet accent. We had trouble figuring out exactly what the herbs were- but maybe sage and/or rosemary? It came with a side of lingonberry sauce- which frankly, tasted exactly like cranberry sauce to me, and it was perfect alongside the rich meatballs. The mashed potatoes were ohhhhhhhhh so good. Creamy with just the right amount of lumps. A treat I rarely consume but can’t turn down if they are right in front of me. I guess tomorrow’s run will be extra long to compensate- but it was sooooooo worth it. I had every intention to get an espresso drink and dessert, but was way too stuffed to even contemplate it by the time I finished my lunch. I will plan to go back on another occasion to try a few things. There was a marzipan covered cake with my name all over it, not to mention the tiny, perfect looking pieces of freshly made chocolate. I’m so glad I was introduced to this restaurant. It’s definitely not the same ol’ same ol’ menu-wise, or in a neighborhood I usually venture to, and I look forward to returning soon.